He is 85 years old and uses a walking stick, but Sulak Sivaraksa is the latest person to face a lengthy jail term under Thailandâ€™s strict law against offending the monarchy â€” or at least a king who died centuries ago. Mr Sulakâ€™s lawyer said that the case would test whether Thailandâ€™s tough lÃ¨se-majestÃ© laws protect historic members of the royal family. Mr Sulak was charged yesterday because he questioned the account of King Naresuanâ€™s battle with a Burmese prince in 1593. The king is said to have won a duel fought on elephant-back. POLICE YESTERDAY decided to proceed with the indictment of noted social critic Sulak Sivaraksa for allegedly violating the lese majeste law when he questioned whether King Naresuanâ€™s famous elephant battle during the Ayutthaya Kingdom in the 16th century actually occurred. The decision came after almost three years of investigation as the intellectual was brought yesterday to meet prosecutors at the Bangkok Military Court. Police charged Sulak with lese majeste days after he questioned the historical accuracy of King Naresuanâ€™s heroic elephant battle in an academic seminar on October 5, 2014. The duel, in which the late King is said have been victorious over Burmese Crown Prince Mingyi Swa, is often regarded in Thai mainstream history as a momentous victory that freed Ayutthaya from Burmese rule. King Naresuan the Great, recognised as an icon of emancipation, is highly revered by ordinary people and the military. The Thai Armed Forces regard January 18 as Thai Military Day to commemorate the victory, although the story is not related to modern-day military affairs. Sulak made comments relating to the battle that differed from the mainstream narratives, prompting two Army Lt-Generals to file charges against him with the police for violating lese majeste on October 16, 2014. The lese majeste law, according to Article 112 of the Penal Code, reads: â€œWhoever defames, insults or threatens the King, the Queen, the Heir-apparent or the Regent shall be punished with imprisonment of three to 15 years.â€ Sulak was yesterday escorted to military prosecutors, who will have the final say on whether to issue a prosecution order against him. He is due to hear the decision on December 7. 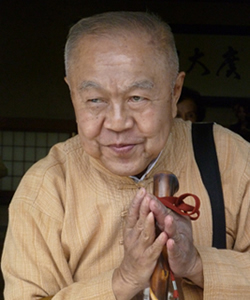 Sulak Sivaraksa, born 1933, is a prominent and outspoken Thai intellectual and social critic. He is a teacher, a scholar, a publisher, an activist, the founder of many organisations, and the author of more than a hundred books and monographs in both Thai and English. Educated in England and Wales, Sulak returned to Siam in 1961 at the age of 28 and founded Sangkhomsaat Paritat (Social Science Review). This became Siamâ€™s foremost intellectual magazine, dealing with numerous political and social issues during the time of the military dictatorship. Sulakâ€™s work editing Sangkhomsaat Paritat led him to become interested in grassroots issues. He learned that to truly serve society, one must stay in touch with the poor people. Beginning in the late 1960s he became involved in a number of service-oriented, rural development projects, in association with Buddhist monks and the student activist community. During the 1970s Sulak became the central figure in a number of non-governmental organisations in Siam. These include the Komol Keemthong Foundation (named for a young teacher killed in 1971), the Pridi Banomyong Institute (named for the father of Thai democracy), the Slum Childcare Foundation, the Co-ordinating Group for Religion and Society, the Thai Inter-Religious Commission for Development and Santi Pracha Dhamma Institute. Through his involvement with these organisations, Sulak began to develop indigenous, sustainable, and spiritual models for change. Since then he has expanded his work to the regional and international levels. He has co-founded the Asian Cultural Forum on Development and the International Network of Engaged Buddhists. In 1976 Siam experienced its bloodiest coup. Hundreds of students were killed and thousands were jailed. The military burnt the whole stock of Sulakâ€™s bookshop and issued an order for his arrest. Although Sulak was forced to remain in exile for two years, he was able to continue his activist work in the West. He lectured at the University of California Berkeley, Cornell University, the University of Toronto, and throughout Europe. In 1984 he was arrested in Bangkok on charges of criticising the King, but international protest led to his eventual release. In 1991 another warrant was issued for his arrest and Sulak was forced into political exile once more. He came back to fight the case in the court in 1992 and won in 1995. At the end of that year he was granted the Right Livelihood Award, also known as Alternative Nobel Prize. He sees Buddhism as a questioning process. Question everything, including oneself, look deeply, and then act from that insight. He is among a handful of leaders world-wide working to a revive the socially engaged aspects of spirituality. Whatever he does, however he does it, at the core of his work is a mission to build a new leadership for change at all levels, within Siam as well as outside it. Much pioneer work has been accomplished, and the foundations for meaningful social change have been laid. Now the challenge is whether this spiritual, activist vision can be sustained and kept growing as a stronger and more influential movement in the medium and long-term. As our visionary leader grows older, more and more responsibility falls on the younger leaders and NGOâ€™s he has so carefully nurtured over the last thirty years.